I'm sharing every step of growing my social followers from 0 to over 5,000 in less than 5 months. There are thousands of articles that have been written about ways to grow your social media following (some of which by myself), but one of the things that most articles fail to cater for is actually growing them from nothing. We all know how Coca Cola, Pepsi and Oreo have built enormous social media followings, but what if you’re not a huge brand? How about if you’ve just set up a blog and had no real online presence beforehand? 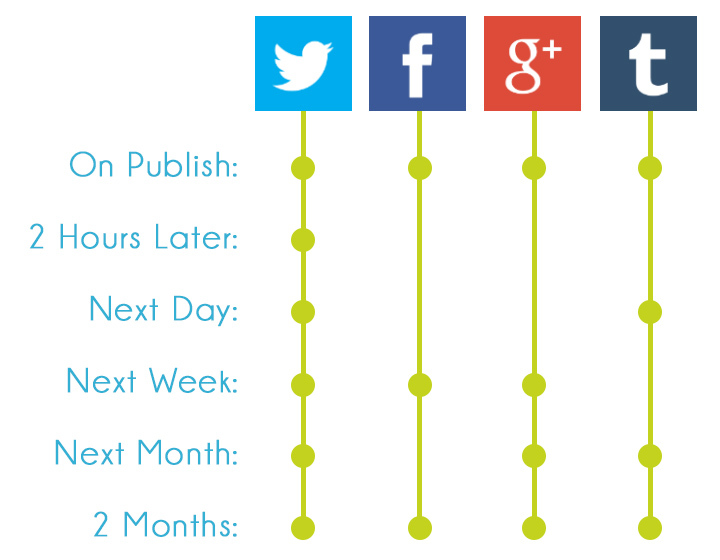 This is what I’m going to focus on - the first 3-4 months of your social media campaign. One thing to mention before I get started is that it’s really easy to get disheartened during the early stages of your social media campaigns. Things are slow at the beginning and it can feel like you’re running in circles a lot of the time. The reality is that most social media campaigns won’t really deliver any real results until you’ve got a fair few months into them. Even then, depending on what niche you’re in, it can take much longer. The most important thing to remember is to keep focused. Have a strategy and stick to it - even if it feels like you’re going nowhere. I’m going to use a real example within this post so that it’s not just a load of theory. 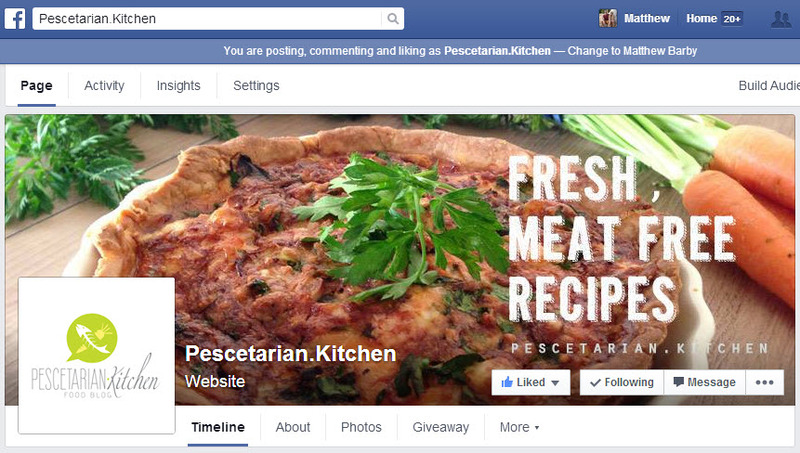 The example will be my new food blog, Pescetarian Kitchen (if you didn’t know already, I’m a huge foodie!). The food blog has been running for 5 months now and I’ve already had some fantastic results from the social media campaign, so this will be a perfect example to show alongside all the points I make. No fluff, just results-driven advice (as always). Oh, and the final note I’ll make is that I haven’t spent a fortune either. My maximum monthly budget for the social media campaign is £80, so this will apply to bloggers of all budgets (you can just scale up or down where necessary). So you’ve just set up your blog. You have a new website and you’ve finally managed to get your custom email address to work. You’re all ready to start making waves online and it’s time to hit your first million likes on Facebook. First, you need to decide on which social networks are going to be right for your content. Contrary to what many people say, there isn’t really a right or a wrong answer here. I’ve seen tons of examples of brands and blogs that carve out engaged audiences within unlikely social networks – it’s all about how you deliver your content to the audience you’re targeting. With the example of my food blog, I knew that the imagery within the recipes would be a huge determiner of its success. 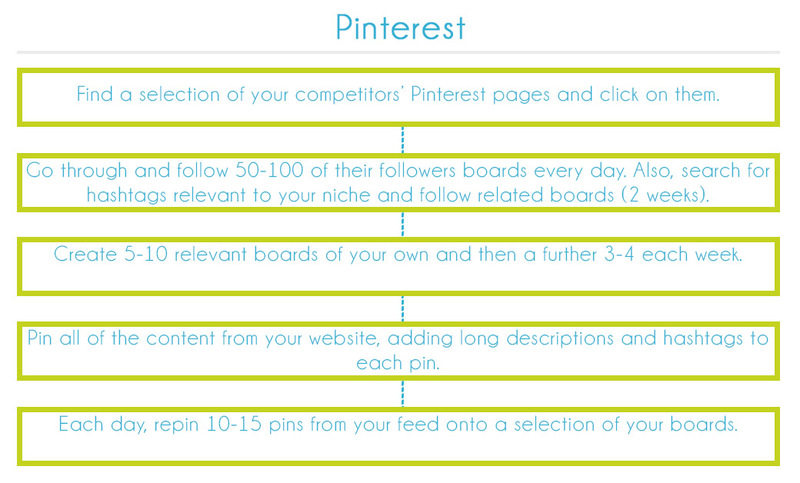 With this in mind, I wanted to choose social channels that would play to the strengths of my content. At the same time, I didn’t want choose too many channels as this could spread my time too thin. 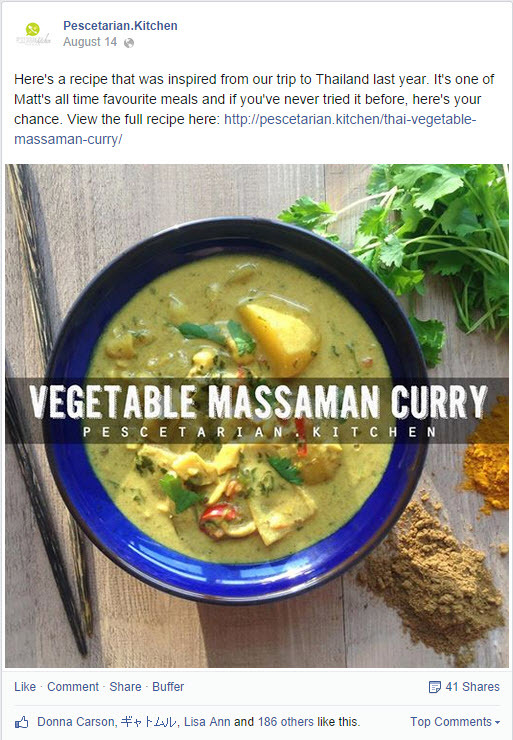 The main objective of the social campaign was to drive back targeted traffic through to my recipes. Within these three channels, I felt I had the best possible chance. On the other hand, within this blog, my main target channels are Google+, Twitter, YouTube and SlideShare. This is because I have a lot less unique imagery and more video and text-based content. Also, a lot of my target market is active within these channels. You don’t need to reinvent the wheel here, but consistency is key. With my food blog, the way that I have separated my posts from my competition is through the imagery. Each of the photos that I take for the blog are resized to fit perfectly within Facebook, Twitter and Pinterest. Then, using a simple overlay, I add the title of the recipe and our blog name to the image (as above). This takes around 10 minutes for each post and has such a big impact on the engagement levels and brand recognition amongst our followers in the long term. These are just a few. I actually wrote an article recently that named 64 different content marketing tools that you may find useful. Don’t underestimate the power of good imagery, or at least consistent imagery. Within channels like Facebook, Google+ and Twitter, image-led posts have a much greater engagement rate than any other. If you start creating custom images to share on social media then you need to make sure that you have a process in place to create and share them as easily and quickly as possible. As I mentioned, I spend 10 minutes on resizing the images of a post and overlaying them with text for each social network. To ensure that it’s done as quickly as possible, I’ve set up custom cropping profiles within Photoshop so that I can quickly crop each image to fit for Facebook (500px x 500px) and Twitter (440px x 220px). I have also created an overlay that I then paste on top of the image and just simply edit the text. Once this is done, I use Buffer to schedule each of my social media posts in with all of the imagery attached. The first step is to identify some of the leaders in your niche. I usually start with some simple Google searches. For example, with my food blog I searched for terms like ‘vegetarian blog’, ‘pescetarian blog’, ‘vegan blog’. This returned a load of blogs that were a really specific type of food blog that caters for a sub-audience within the food niche. This is a much better benchmark competitor than just a general blog (unless your blog is really general). If I was looking for competitors of my digital marketing blog, I’d search for terms like ‘SEO blog’, ‘content marketing blog’, ‘social media blog’. It sounds really obvious, but this is the simplest way to find a load of similar blogs, and blogs are a great source of inspiration for social media campaigns (mainly due to the volume of content produced). Once you’ve collated a list of around 20-30, it’s time to extract their social media profiles. You can go and do this manually by visiting their website and then finding their social links (usually via some icons at the top or bottom of the page), or you could use a tool like BuzzStream (paid tool) that will automatically pull in any related social media profiles and email addresses. Once you’ve collated all of the social media profiles, it’s time to gather their total follower counts (if you did this via BuzzStream then you’ll already have this data). Again, you can do this by manually visiting each of the social profiles and copy/pasting the values over, or you can use a little bit of automation via scraping. View my full tutorial on data scraping here for information on how to do it (there’s far too much to go into within this post!). 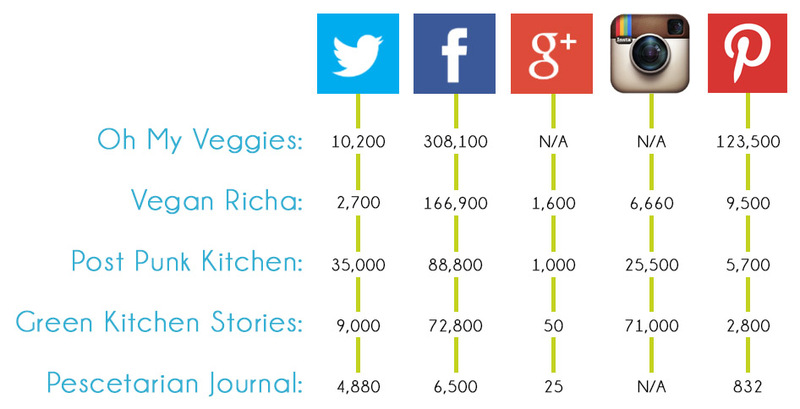 Within the research for my food blog, I benchmarked against Oh My Veggies, Vegan Richa, Pescetarian Journal, Post Punk Kitchen and Green Kitchen Stories. I signed up to each of their newsletters, subscribed to their RSS feeds, followed them on Pinterest & Twitter and followed them on Facebook by adding them to my Pages to Watch list. 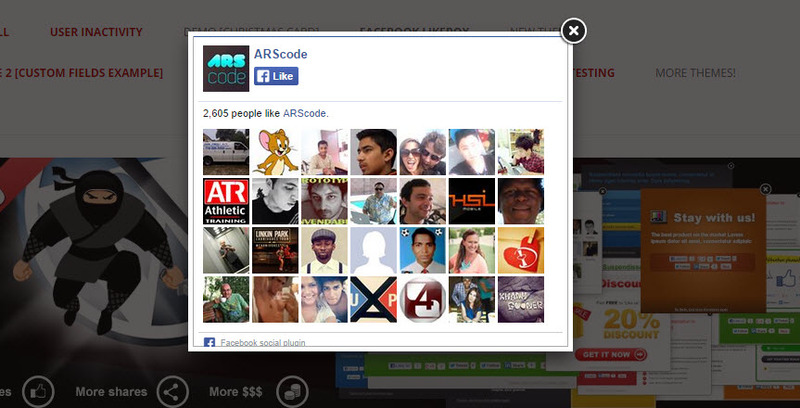 If you haven’t used the Pages to Watch feature in Facebook then start doing it now – it’s awesome. 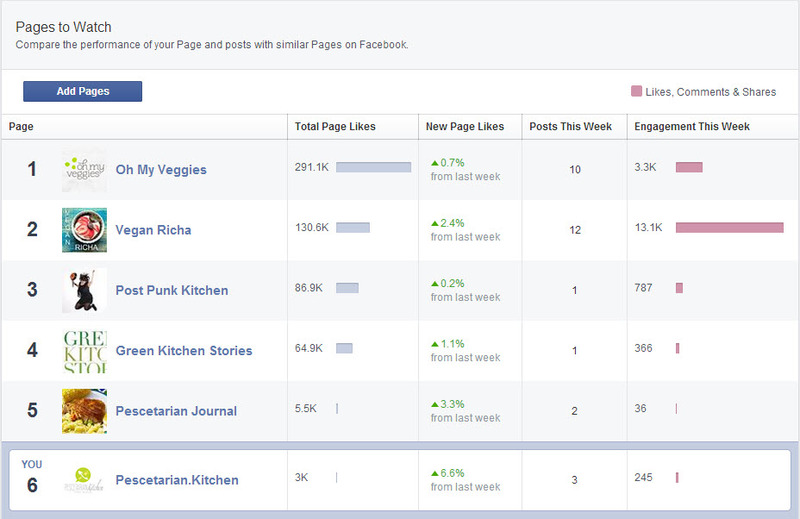 All you need to do is navigate through to your Facebook page and click on the Insights tab at the top. Scroll down to the bottom of the Overview page and you’ll see a section where you can add pages (like in the image above). The great thing about this feature is that you can check on the growth of your competitors’ followers, how many times they’ve posted each week, their engagement score, and it will also notify you if one of their posts has had a lot of shares. I really like the engagement statistics that you can get because they hold so much more weight than just the number of followers you have. When I compare the engagement levels of my food blog, it’s nearly at the same level as one of my competitors that has over 20x more followers than me – not bad. …highly visual posts (no link posts), with a 3-4 line description and a link through to the content at the end. The posts that were performing the best were those with colourful, big impact imagery – without this, I’d be in trouble. Now, I like to consider myself a very creative person. Unfortunately, for all of my digital experience, I’m a complete novice when it comes to using a camera. I took a few test photos of a few recipes and they looked awful… I mean, really awful! There was only one thing for it… I needed to call in help. I needed to ask my competitors. It sounds crazy, but bloggers are often really receptive to helping out others, especially if you’re new to the game. I started with Kiersten Frase of Oh My Veggies. I'm just dropping you a quick email asking for some advice (I hope that's ok). My partner (Laura) and I have been toying with the idea of starting our own food blog for some time now as we love cooking and are always trying out new recipes. We read the Oh My Veggies blog religiously and have made so many awesome meals as a result. In particular, I love the photography within each of your posts - so thanks! Both Laura and I are pescetarians but we pretty much eat an 80% vegetarian diet (hope you're ok with me asking considering we still eat fish). One of the areas that we're struggling with is photography. We haven't invested in a good camera yet (using an iPhone 5 for now, but will invest more once we get going). We want to be able to keep our photos looking rustic and different each time, so we spent around £150 on a few props from a vintage market, including a wooden crate, some different plates, an old Hovis tin, some old rustic milk bottles, unique teacups, etc. Would you have any advice on some really great props to use within your photos that you're really keen on? Do you have any tips for how we can make our photos look as good as possible (we live in an apartment so don't have a garden, but we do have huge full-length windows)? Do you tend to spend a day cooking a load of recipes and then do a bulk load of photos, or do you tend to do a one a day (or something along those lines)? I'm just thinking about how to balance the time we spend on things as we both work 9-6 each day. Looking forward to hearing from you, and sorry for the essay! Keep the good recipes coming. - One of the areas that we're struggling with is photography. We haven't invested in a good camera yet (using an iPhone 5 for now, but will invest more once we get going). We want to be able to keep our photos looking rustic and different each time, so we spent around £150 on a few props from a vintage market, including a wooden crate, some different plates, an old Hovis tin, some old rustic milk bottles, unique teacups, etc. Would you have any advice on some really great props to use within your photos that you're really keen on? I started out using my iPhone too. 🙂 I actually wrote a post about it, which you might find helpful: http://ohmyveggies.com/food-photography-with-an-iphone/. The photos will always be a little bit grainier than ones taken with a DSLR, but 90% of taking a quality food photo comes down to knowing how to work with the light. As for props, vintage items work well, but white bowls and plates definitely get the most use in my kitchen. I try to find them in interesting shapes so they have some visual interest without being distracting. A lot of bloggers use vinyl backdrops for that rustic boards look: http://www.etsy.com/ca/shop/InkAndElm?ref=l2-shopheader-name. I've heard that overseas shipping is high for these, but maybe you can find someone who sells them in the UK. They're a little bit tricky to use because if the light hits them at certain angles, you can tell they're not real wood! - Do you have any tips for how we can make our photos look as good as possible (we live in an apartment so don't have a garden, but we do have huge full-length windows)? The post on iPhone photography has a picture of my set-up, although currently, I have the table pushed right up against the window, which I've found works better. I use white foam boards to bounce light around. Sometimes I'll make a "box" around my window with foam board on all sides so the light bounces in all directions--when I'm ready to take my photo, I hold a third foam board right under the camera. This works because I have a tripod, but without a tripod, you just need a second person to hold the board. If you have a north-facing window, that works best. Otherwise, you may need a scrim, white bed sheet, or gauzy curtain to soften your light a little bit. Light that's too harsh creates shadows. It's still a work in progress, but I'm going to be launching a blog about blogging soon because I get so many questions like this. I have a bunch of food blogging related resources in the sidebar (they are affiliate links, FYI!) that you might want to check out. In particular, I've found the Photographing Food e-magazines and Tasty Food Photography books helpful: http://kierstenfrase.com/blog/. I also have some other resources and equipment here: http://marketplace.ohmyveggies.com/what-i-use-in-my-photography/. Plate to Pixel was the book that taught me food photography when I was still using my phone to take pictures! - Do you tend to spend a day cooking a load of recipes and then do a bulk load of photos, or do you tend to do a one a day (or something along those lines)? I'm just thinking about how to balance the time we spend on things as we both work 9-6 each day. I may take you up on that. 🙂 I have an ebook in the works and I'd like to have it rank highly in Google. I actually used to work for a search engine doing anti-SEO work (!!!) on a webspam project, so I've never done much with SEO at all on my blog. I kind of pick a keyword and let the chips fall where they may. With Facebook reach cratering, I think I need to focus on SEO a wee bit more. I can’t even begin to explain how helpful this was and I got straight to work on following Kiersten’s advice on taking great photos on a budget. This just shows what a quick email can get you. Using this as a general rubric can help you schedule each of your new blog posts to be shared a number of times over a two month period. I’d recommend doing this all in one go as it can save loads of time in the long term. You can also reference back to the competitive research that you’ve done to check out how frequently the most successful competitors are sharing content. This will help you gauge how receptive the people in your niche are to social posts. Well, don’t worry. The aspects that I’ve covered within the previous section of this post must have been considered before you even think about growing your social media following. If you have no strategy to begin with, you’re doomed to fail. Twitter is one of the easier channels to start filtering in some followers through to. One of the reasons behind this is that a large majority of users will often follow you back if you’re relevant to their interests. Sign up to a free tool like Tweepi that allows you to search for your competitors’ followers and follow them. Plug in the Twitter handle of one of your competitors to reveal a list of Twitter users that follow them. Now sort this list by the ones that have been active most recently (this ensures they are active accounts). Go through and follow between 75-100 of their followers. Don’t do any more than this or you risk your account being banned (this really does happen and it’s really frustrating so don’t risk it). Later the next day, log back into Tweepi and use the Flush Followers setting to unfollow any users that aren’t following you back. Repeat processes three and four for the next two weeks. Following this simple process should get you a few hundred relevant followers on Twitter. This is a good start and will give you the opportunity to begin engaging with an audience. You may also want to check out this process from Matthew Woodward that enabled him to double his Twitter followers. This sounds like it can be quite time consuming, but if you just grab the Pinterest app for your smartphone then you can get the daily stuff done in around 15 minutes. Facebook is a little tougher to get some quick organic followers. My recommendation here is to spend a small amount on some Facebook advertising. However, an alternative option is to seed the page with a few of your personal contacts. Go through to your Facebook page and select the option asking if you’d like to invite your friends. Go through your list of friends and get them to like the page – this is good to just get some initial numbers on there. Once you’ve got a few likes on the page, run some advertising through to audiences with interests relevant to your niche. Try to keep the audience size fairly low – aim it at less than 100,000 people to keep it as targeted as possible and drive down the cost per click. Aim Facebook ads at your website visitors to convert traffic into your social following (this is an awesome long-term strategy). Create a call-to-action across your blog that gets people to like your Facebook page (here’s a great WordPress plugin for this). Once you’ve got your page set up, you’ll want to start looking at ways to follow a number of relevant people. 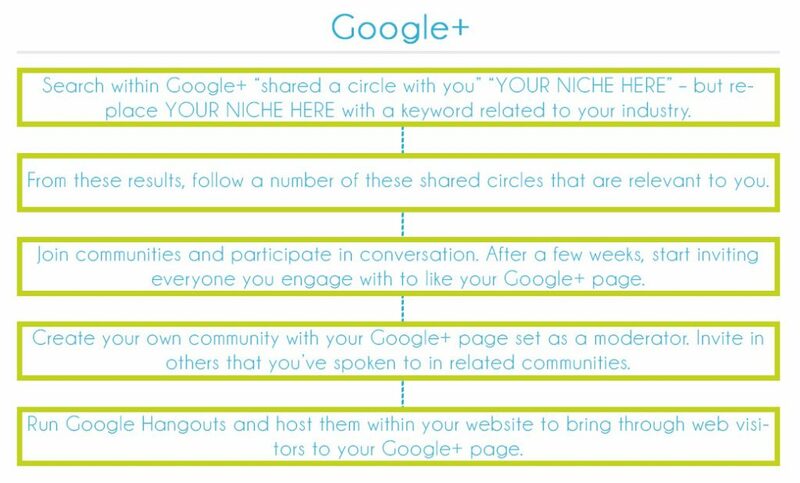 Search within Google+ "shared a circle with you" "YOUR NICHE HERE" – but replace YOUR NICHE HERE with a keyword related to your industry. This will bring up a ton of circles that you can follow that will add 100s of relevant users to your following. You should start seeing loads of new followers off the back of step one, but in addition to this, you can join a number of groups relevant to your niche and start inviting members to like your page. Start your own community with your brand as the moderator and invite people in to become members. You can keep influencers involved by giving them moderator privileges. Go through this huge spreadsheet to find relevant circles that you can add people with. Go through this post I wrote a few months ago and follow some of the extra steps. I wrote a HUGE article on running online competitions in September last year that took a detailed look into how to set up and run successful competitions. Now, since writing that guide I’ve been running a lot more competitions for a number of my clients and also my personal projects, so I’ve got a few extra tips to share. 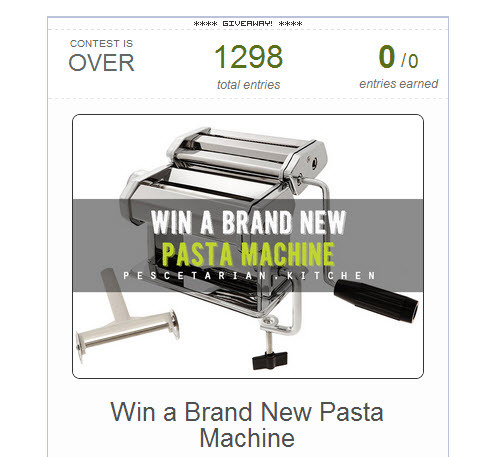 Just to give you an idea of the impact that competitions can have for your social following, here’s a recent competition that I ran on my food blog to give away a brand new pasta machine. The competition ran for four days and had 1,298 entrants. In order to enter the competition you had to follow my blog on Facebook. Additional entries to the competition were available if you also followed me on Twitter and Pinterest. On top of this I gathered over 500 email addresses that can be used to send my newsletter to. Considering that the prize was donated to me by a company that I partnered with, there was little to no expense involved but the results were amazing. One thing to remember when planning an online giveaway is that a competition doesn’t run itself. You need to actively promote the competition to gain some traction, no matter how good the prize is. Decide upon a giveaway prize: where possible you should keep this relevant to your business/website. If you’re just giving away an iPad because you think lots of people will love it, you may just be building up your social following full of people that are interested in iPads but don’t care about you at all (hence why I gave away a pasta machine on my food blog). Source the prize: if you’re a blogger, the likelihood is that there will be a whole host of companies that would be willing to supply you with a competition prize in exchange for a mention within your giveaway. Use a free service like ResponseSource or Muck Rack to submit a request to companies for a competition prize and you’ll likely get a few offers. Alternatively you can purchase the prize yourself. Set up the competition page: you’ll want to write out some clear instructions for how people can enter, what the restrictions on entries are (e.g. UK only), how long it will run for and some details around the prize. It’s good here if you can place a custom image that could be shared to Pinterest (if relevant). When it comes to creating a competition widget, I always use Rafflecopter and I’d strongly recommend you use it as a platform to run your competition – it’s awesome. Create custom sharing images: another tip that I’ll give you is to create a variety of different images that are sized to fit perfectly within Facebook, Twitter, Pinterest, Google+, etc. so that you can share image-rich posts to promote the competition. Promote the competition: promoting your competition can be tricky, but there’s a load of great (and cost-effective) ways to do this. The first is to promote it through competition websites like Prize Finder (free). Secondly, you can get in touch with other bloggers to help promote the competition on their website for you – you may need to link to them from the competition page to get them on board. Another good avenue is to run some advertising through Facebook ads, Twitter ads, StumbleUpon or Reddit. This doesn’t need to cost a fortune either. Choose a winner: if you’re using Rafflecopter, all you need to do is go into your dashboard once the competition has ended and select a random winner. You’ll then be able to send them an email to arrange delivery, etc. Make sure you also announce it across your social channels and on your website. If you don’t know what you’re doing, social advertising can eat up all of your funds and deliver nothing in return. That said, if done correctly it can give some incredible results. The first thing that you need to decide is what you want to achieve and where you want to achieve it. If you go in with the sole objective of “I want more Facebook likes” then you’re probably not thinking about it correctly. Yes, you want Facebook likes, we all do, but what is it that you want from those followers? At the time of writing I have 4,359 likes on my food blog’s Facebook page yet the organic reach of each post will often hit between 200-400 people (without significant activity on the post). Now, that’s not ideal. The bad news is that this is only going to get worse. 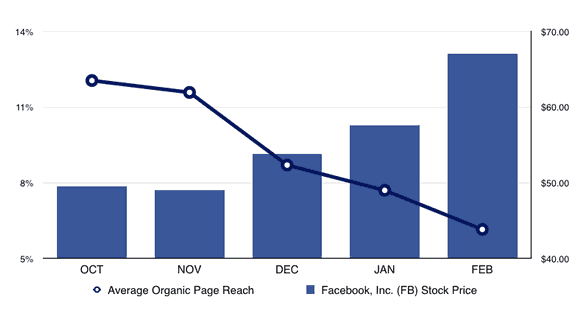 It’s no surprise that a reduction in organic page reach will benefit Facebook because more and more brands (and individuals) are being forced to spend more through Facebook’s advertising platform. As you can see, from a spend of just £4.81 I’ve had 42 visits to the blog, 140 post likes and 39 shares of the post. I usually run the ads for 2 days on each post because I have new blog posts coming out every two days, plus I don’t want to constantly flood everyone’s timeline. Each month I will spend around £60 on promoting the content to existing Facebook followers and it’s money well spent. I get the best results from Facebook ads by a long shot – this is mainly due to the visual nature of my content. Now, these ads are geared towards two different audiences. The first audience consists of anyone who has visited the blog but hasn’t followed us on Facebook. The second is anyone who follows any similar blogs or is in any groups or events within Facebook that are focused around pescetarianism. Navigate to your Facebook advertising account within Facebook. Here’s the link. Click on the Audiences button in the left hand column, which will take you here. Click the green Create Audience button in the top-right corner of the screen and then select Custom Audience. Now choose the fourth option down, titled Custom Audience from your Website. Enter an audience title, for example, My Website Visitors. Select the duration of the tracking to last 180 days (this keeps all the data for as long as possible so you can keep using it for remarketing. Press Create Audience and then copy the tracking code supplied to you and paste it within the <head> section of your website. You’ve now set up website visitor tracking. 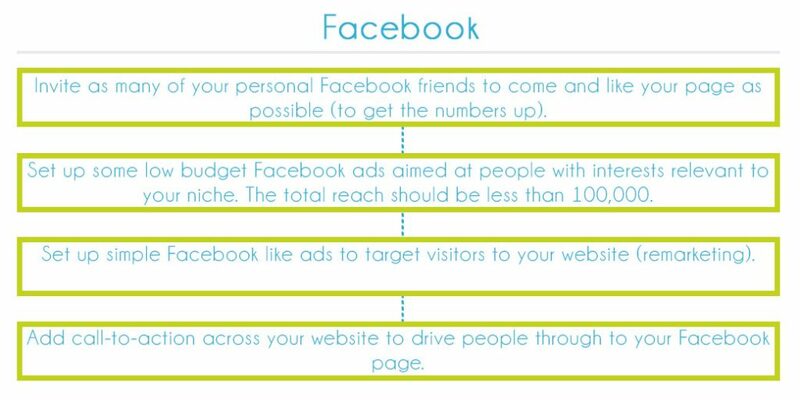 You’ll start to see the size of your audience (within Facebook) grow day-by-day and this means that you’ll have more and more people to target your ads to. You can even go granular and create different audiences based on different areas of the website that they visit, but I’ll keep it simple for now. Once your audience reaches around 1,000 you’ll have enough to start getting some good results from an ad campaign. Simply go into the Audiences section again and select Create Advert to get an ad setup for these users to like your Facebook page. …reading that line back now makes me realise that it was actually a pretty crap call-to-action, but you get the idea! 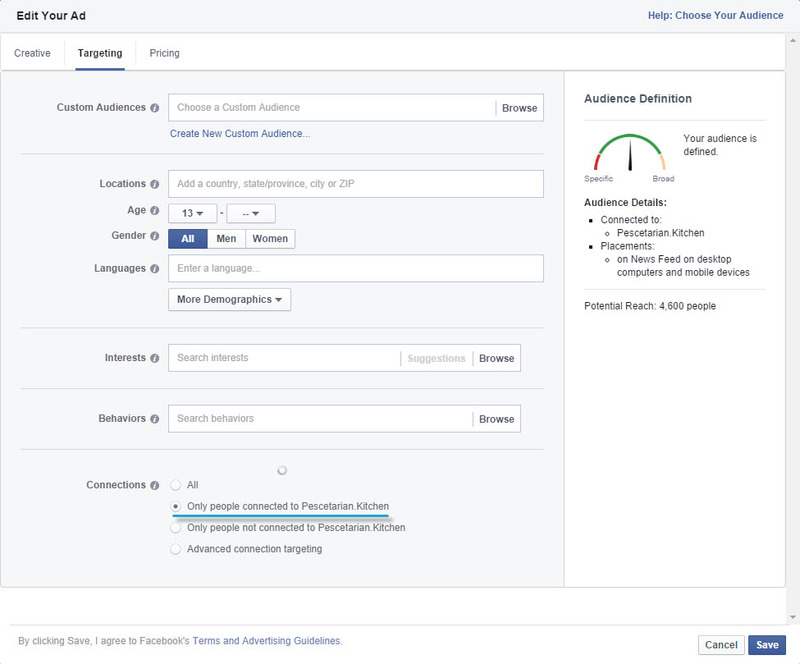 Tip: You can also create a Lookalike Audience within Facebook ads based on the types of people that visit your website to then create a large audience to market to. This is a great way to use sampling to attract new, relevant users. This is one of my favourite tricks that helps you ensure that you’re only targeting the most relevant people to you. The traditional way to target a large quantity of new users is to go through Facebook’s advertising platform that will allow you to choose users based on their interests, demographics, etc. Now, if you’re anything like me then you’ll hate doing this. It’s kinda like just saying to Facebook, “Hey, could you just go and target my ads at like 2,000,000 people that you think like stuff related to me?” and then you just take their word for it without ever seeing who these people are. Well, I decided that this wasn’t good enough and I wanted to ensure that I had more of a solid basis for my targeting. Instead of relying on Facebook saying that “these people are interested in Pescetarian Food”, I’ve been scouring through the followers of other pescetarian food blogs to build out lists of people to target (who would clearly be interested in the type of content I’m sharing). Likewise, I’ve been going through any events and groups and adding all of the members into custom audience profiles. If you’re getting a little confused as to where the option to do this in Facebook ads is, that’s because there isn’t one. You’ll need a sneaky little tool called Facebook ID Scraper. There’s a lot of work that you can do to cross-promote your social accounts when you’re producing content on your website. If you’re a WordPress user then there’s a whole host of plugins that you can use, but you can also do some little bits yourself (without any knowledge of coding). One of the best ways to drive through your web visitors to your social media pages is through some non-intrusive calls-to-action. You’ll see this a lot within blogs – my site is a perfect example. A WordPress plugin that is fantastic for this is Social Locker. Social Locker, which you can see in action above, allows you to hide specific parts of your content until your reader shares it across social media. 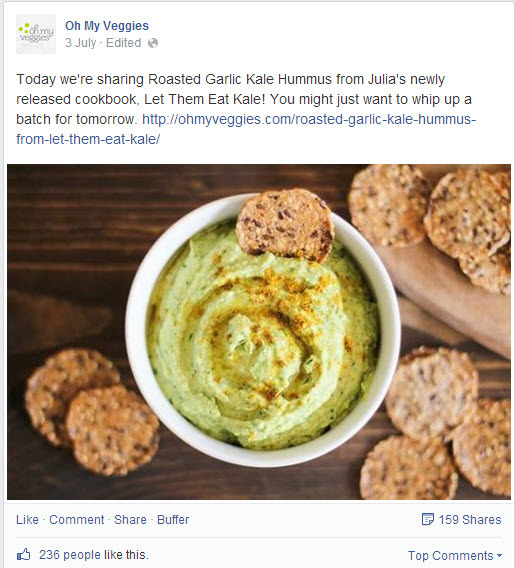 This is a great way to increase the social reach of your content and ultimately increase your social engagement. When it comes to incentivising people to use the social locker, you could offer things like a PDF version of the article (for offline reading), some extra resources, discount codes, etc. Just make sure that it’s relevant. Another way to get people through to your social profiles is to add in exit pop-ups. These are pop-ups that are triggered whenever anyone attempts to leave your website. The pop-up could be a simple lightbox asking if the user would like to follow you on Twitter, Facebook, Pinterest, etc. A great plugin for using exit pop-ups is the Ninja Popups plugin for WordPress. I’ve used this plugin to great effect over a number of different blogs in the past two years. This one sounds really obvious but it’s surprising how many people don’t actually link to their social media profiles within their website header, footer or sidebar. This is something that’s pretty easy to implement, even without a plugin, but if you prefer to have something that looks really nice and also saves you any hassle of coding, you can use the SocialBox plugin for WordPress. I actually get a lot of click-throughs from the social links on my blog so it’s definitely worth it. You can measure the impact of adding them in by setting up event tracking in Google Analytics (here’s a tutorial that I wrote on doing this). Adam Brown, Search and Data Consultant at Zazzle Media. One social channel that still interests me a lot is Facebook. Around January 2012 I started a couple of pages based on quotes and phrases and now in total have more than four million Fans. Initially the way of growing those pages was simply to post content that had a high propensity to be shared but when Facebook changed the newsfeed algorithm it destroyed the reach those pages had. I learnt a lot from that experience and the one thing I really regret about that time is not taking the fans into consideration. I pushed links and pictures at a user base that really didn’t want to see them. and the learning from this has been to shift to a much more audience-interest based content strategy. 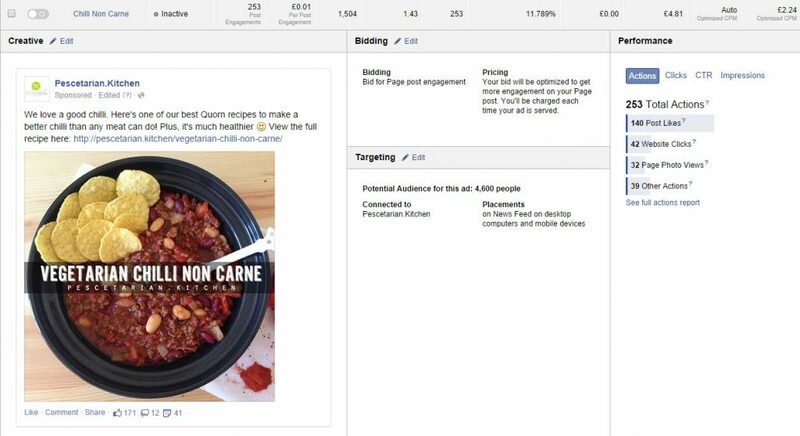 A dual approach that combines date driven editorial with paid adverts for acquisition is now the ‘secret sauce’ you need to have a successful page but that doesn’t mean you simply switch the ads on and that’s it. You must test content types to see what works and what doesn’t. The audience for one of the pages I run likes 'love quotes' whereas the other main channel likes funny animal imagery. Throughout the testing phase the reach was awful but as I started to learn and get feedback from the users the reach increased again. Below you can see how reach has improved on those pages throughout this testing phase. 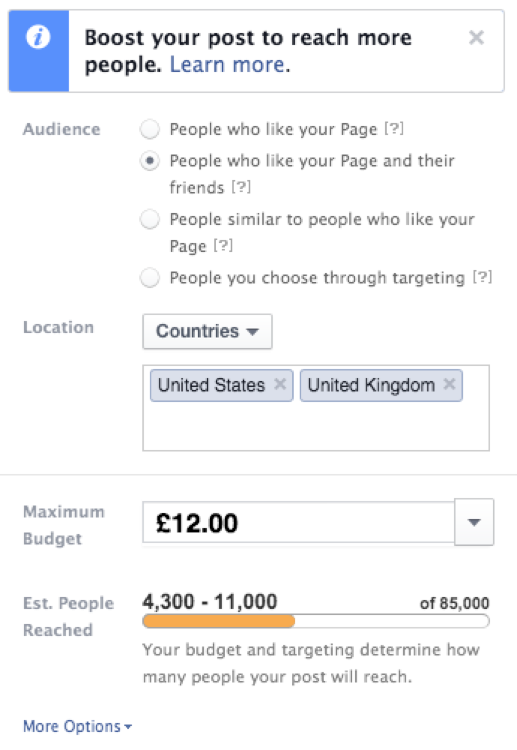 Paid adverts are really simple especially within Facebook, The dreaded ‘Boost’ button can actually be your friend. If you already have a Facebook page with some fans trying the Boost to fans option can help you already reach people who are interested. This does only work if your fan base is real! It’s so simple and if you only have a smaller page the amount you will spend will be minimal. Just a BIG thank you for this awesome article. I started my blog a few months and your post came on my Twitter timeline. It is of great help for me because I would like to promote my posts/blog on Facebook (to start with). You will help a lot of people with this ! No problem, Alexandra. Glad this has helped! Awesome post Adam / Matthew. This is a really good template for people to follow. It’s interesting that you’ve pitched this as a ‘first few months’ strategy. To be honest, it’s great going forward too! With a little bit of scaling and slightly more automation, you could have a seriously good long term social strategy! There’s a few things here I don’t do, normally a Twitter man, but just got round to creating a Facebook page for my blog and a new Pinterest account. I’ll certainly be following this advice to get started! Thanks 🙂 I wrote the post but the tip at the end way from Adam. Good luck with implementing some of the things I’ve went through. Hey Matt – great post. My girlfriend runs the food blog avocadopesto.com, so this is very relevant. We’ve been working on the digital strategy and over the last 6 months have seen incredible results (doubling the page views, increasing organic traffic 4x, newsletter opt ins from 0 – 2500, etc) Will add a lot of this to my list. I’m just getting my feet wet with social media, and this post has made everything sooo much clearer for me. I’ve bookmarked it and am in the process of setting up 3 tests. 1 question I have is what do you recommend for handling multiple social media profiles – especially Facebook? The reason I ask is because I’ve had a few FB accounts locked ( I think it may have been an IP issue), and I just wonder what’s the best way to have multiple accounts/pages on social media without getting blocked? Thanks Matt for the awesome info, and I look forward to your reply. The best thing here is to use a tool like Sprout Social or Buffer to manage multiple accounts all from one dashboard. Sorry if I was unclear in my last comment, but I was referring more to creating social accounts/pages for multiple clients. Could I create all of these for each from client on their behalf using my own IP, or would I need to use proxies when setting up each clients account? Thanks again for the help, and sorry for the long reply. This is hands down the most useful guide to social media (especially facebook) that I have ever read… I just checked google and yep there’s definitely nothing out there that comes close. One note for you – the “pages to follow” feature is only available when you have more than 100 likes. Hey you said starting from 0! Very interested to see how the visual posts with link above go versus the typical link post and default image/text preview.. not having the picture as a link seems like a bad idea… anyway I will test and see how it goes in my market. That’s a very good point, completely forgot about the 100 likes limit. My advice for this… just run some FB ads to get up to 100 likes, or invite a load of your FB friends to like the page so that you can use the feature. Well spotted! Another insightful post Matthew, thank you for taking the time to share your experience and offer up some incredible tips. Great tips, have you checked out canva.com for creative design like Facebook posts etc. They have templates which means you don’t have to play around with Photoshop. Hope it helps. P.s. not affiliated with this site, but I find it incredibly useful. AWESOME write man. You literally nailed it in this blog. You know what interest me most? You are honest from the beginning (number of followers etc) which I think that is a must. Great tips and hey, sharing this out right now! Whoah Mathew. Whattay well-researched, informative post. Glad I stumbled upon it while twitter. Bookmarked so that I can assimilate the strategies on-by-one. Really, really great stuff here. What is your strategy for 0-1000 on Linkedin? I know it’s quite a different beast, and far less engaged, but our target demographic is on Linkedin far more than Facebook. Thanks! I do a LOT of work within LinkedIn for my clients and the trick is to map out a solid prospecting programme. Start by identifying key individuals you’d like to engage with, create a messaging pack (i.e. some tailored messages you’ll send to each, begin to outreach manually through offering content/incentive and then start channelling discussions through to your LinkedIn page. Found this article from the weekly Best-Of of a BlackHat Forum..
Matt this advice is gold ! I’ve been desperately looking into how i could grow an audience of Local entrepreneurs in order to pitch my SEO services.. this has been quite instructive ! Lil’ question,how different would your strategy be if you only had to share Content rather publishing your own ? Hey Kaiz, thanks for your comments. If I had to share content that wasn’t mine without creating my own (which I’ve done on a lot of projects before) then I’d try to add a level of personal branding to my shares. For example, one thing that I’ve done in the past is to create custom images to share with posts from other authors – this dramatically increases the number of retweets/reshares, etc. that you get from the content creators themselves. I’d also put a lot more of a focus on email marketing, keeping regular communications with my followers and engaging with influencers/top content producers in the niche. I’d also maybe look at adding some level of user-generated content functionality to my campaign (if possible). So…. After 23 minutes I still have no idea how you made 1£ out of all that effort. The marketing results are, well, ok. But what are the business results? All of you “experts” are going to be seen for what you are eventually. All hype. No substance. Hi Jimmy, I think you’re really missing the point here. Blogs like this often don’t start looking at monetization from the beginning. Building a community of followers around a brand is much more important in the long term than making a quick bit of cash. If that was the case then we’d all be calling companies like Snapchat and Whatsapp a complete failure. Thank you for the mention Mr. Barby! Your social strategy is too damn awesome and I am going to follow this in the future and rock in the blogosphere. I cannot thank you enough for this article. I’ve been searching for a resource like this! You bring up a lot of points I hadn’t considered before, including the concept of locked content. I’m excited to take advantage of the online photo editing apps especially. Having great imagery really is the way to stand out from competitors. My guess is some will be surprised at the suggestion you received to invest in props for photo shoots… but an investment in image quality sounds like a good use of funds. Again, thank you so much. This was incredibly helpful. I absolutely loved this article – really useful and best I have found on this topic. Thank you. A question: I just signed up to Buzzstream to help collate competitor/influencer data and I can only seem to get Twitter metrics, rather than all social media (FB, Pinterest etc.). Am I missing something?! Hey Kate, not sure why that is? It may be that Buzzstream has only found the Twitter data for the sites you’ve imported (it’s not always perfect at finding all the data, all the time). It definitely gathers all this extra data though? Great stuff here, very useful tips – I can see I will have to keep a close eye on this blog. I’ve been pondering the idea of a food related blog for ages but always put it off for later while I work on my current project – once I officially launch that I will (ok might!) give the food blog a try! Haha – go for it, Rob. If you need any help once you get started out, feel free to drop me a line. Thanks so much for this article Matthew – it’s helped me absolutely loads with marketing my eBook on social media. I’ve posted a link to this article on my Google+ page (which I created having been inspired by you). I’ve also just started using Tweepi as per your instruction and have got 15 followers in the last three hours because of it! Hey Tom, really glad this has helped you out. Keep me posted with how you get on! Hey Jan, I hadn’t thought about doing this – great idea! I’m really amazed by your style, both content and visuals wise. Apart from all this, which I will definately use in the near future, another thing I learned is that I’m not using my time well, when I see all you can do with yours. Kudos to you man ! Can you use the @facebook.com emails using Facebooks email input advertising feature? Wow. Really great post with practical actionable tips. Thanks! I recently clicked a link through to you from a post on Mat Woodwards blog and have been hooked ever since … your postings are immense and I know that I will be able to gleen massive benefit from these for my main client The Garden Furniture Centre. Just one thing, if you’ll accept some positive criticism the one thing I find lacking on matthewbarby.com is a search function – there is quite obviously such a wealth of information on this site that I would like to be able to scour it for links and advice! I agree – I hadn’t really thought about the search feature on my site but now you mentionit, it could benefit from this. I’ll add it to my long list of updates to be made! Hello Matthew. I’d like to thank you for this very useful post, it was so inspired for me. I have a blog since 2 years ago, it’s about restaurants in Barcelona (i live in this city) and now i’m trying to promote it. There are a lot of blogs that write useless tips but your blog is really really interesting, because it’s based on your experience. Thank you very much and congratulations for your blog! Great advice, wish I could afford you to get hits on my blog! FB ads really working, will work harder on the neglected platforms such as Goggle+ & Pinterest. Thanks a lot. Awesome post Matt- I have to be honest, I find social media so difficult at times- I’ve read on a number of blogs that Facebook would only really work if you opt for paid ads/boosts etc- do you agree? Just a BIG thank you for this awesome article. I started my blog a few months ago. It is of great help for me because I would like to promote my posts/blog on Facebook (to start with). Wow, what a great and thoroughly detailed article! So helpful! For giveaways, you can also try out myRewards from ADfits.com… it’s a new loyalty program for websites and blogs to keep their audience coming back during the course of the giveaway campaign. Disclosure: I’m the Founder of ADfits.